Go to original pattern for design DROPS 99-5. DROPS crochet hook size 4.5 mm or the size needed to obtain the correct crochet tension. Crochet tension: 14 tr x 7 rows using hook size 4.5 mm and 1 thread of each quality = 10 x 10 cm. 1 repeat of the mussel pattern measures approx. 11 cm in the width. Crochet info: Substitute the first tr on each row/round with 3 ch and substitute the first dtr on each row/round with 4 ch. Finish each round with 1 sl st in the 3rd/4th ch from previous round. Pattern: See diagram M.1. The diagrams are seen from the RS. 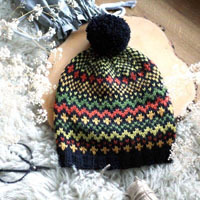 Crochet 2 st tog. to 1 st. Crochet 1 tr but wait with the last pull through (=2 sts on hook), then crochet the next tr but for the last pull through pull through all sts on hook – now 1 tr has been dec. Measurement tips 1: Because of the weight of the yarn, all measurements should be made whilst the garment is hanging, otherwise it will be to long when it is worn. Measurement tips 2: The garment is very elastic. The measurement diagram therefore gives the measures of both the garment and the corresponding body measures. The body measures are marked with * and ** on the measurement diagram. The dress is crochet from the top and down. Beg. 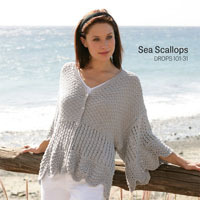 to crochet the front and back piece for the top part, then put the 2 pieces tog. and crochet the bottom part round beg. at the side. Crochet loosely 16-16-18-19-19 ch (incl. of 3 ch to turn with) with 1 thread of each quality using hook size 4.5 mm. Crochet the next row as follows: 1 tr in the 4th ch, *skip 1 ch, 1 tr in each of the following 3 ch*, repeat from *-* until 4-4-2-3-3 ch remains, skip 1 ch and crochet 1 tr in each of remaining 3-3-1-2-2 ch = 11-11-12-13-13 tr. 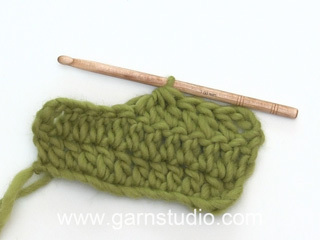 Continue with 1 tr in each tr until the work measures 6 cm – read crochet info. On the next row inc 1 tr as follows: crochet 2 tr in the last tr towards the neck. Turn and crochet back = 12-12-13-14-14 tr. Put work aside. - Crochet left shoulder as follows: Crochet as right shoulder but reverse. 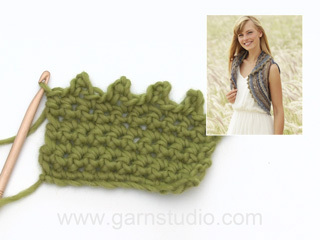 - Back piece: Start to crochet at the side on the right shoulder, crochet 1 tr in each tr. Then crochet 22-24-26-26-28 ch. Then continue to crochet 1 tr in each tr from the neck towards the side of the left shoulder. Turn and crochet back over all tr/ch = 46-48-52-54-56 tr on row. Continue with 1 tr in each tr until the work measures 10-11-12-13-14 cm. Now inc. for the arm holes as follows: Crochet ch’s at the end of each row: 1-1-1-2-3 ch 1 time and 1-1-2-2-3 ch 1 times(on the next row crochet tr in the new ch) = 50-52-58-62-68 tr. Crochet 1 row with tr. Cut the thread. Crochet 1-2-3-4-4 ch before continuing with tr over the back piece and finish the row at the other side with 1-2-3-4-4 ch = 52-56-64-70-76 tr. Crochet 1 row with tr in each tr/ch. The work now measures approx. 17-18-19-10-21 cm. Cut the thread and put the work aside. Crochet loosely 16-16-18-19-19 ch (incl. 3 ch to turn with) using hook size 4.5 mm and 1 thread of each quality. On the next row crochet as follows: 1 tr in the 4th ch, *skip 1 ch, 1 tr in each of the next 3 ch*, repeat from *-* until 4-4-2-3-3 ch remains, skip 1 ch and crochet 1 tr in each of remaining 3-3-1-2-2 ch = 11-11-12-13-13 tr. 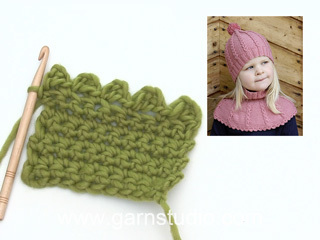 Continue with 1 tr in each tr until the piece measures 6 cm – read crochet info. On the next row inc. towards the neck as follows: crochet 2 tr in 1 tr towards the neck - on each row a total of 7-8-9-9-10 times. At the same time when the piece measures 10-11-12-13-14 cm inc. for arm holes towards the side on every other row as follows: Crochet ch’s at the end of each other row: 1-1-1-2-3 ch 1 time, 1-1-2-2-3 ch 1 time and 1-2-3-4-4 ch 1 time. When all inc. are completed there are 21-23-27-30-33 tr in total on row. The work measures 16-17-18-19-20 cm. Cut the thread and put work aside. Crochet as right shoulder but reverse. When all inc. are completed (= 21-23-27-30-33 tr) crochet 1 row from the armhole towards the neck, at the end of row crochet 10 ch. - Front piece: Continue to crochet over the right front (from neck towards the armhole) = 52-56-64-70-76 tr/ch in total on row. Insert a marker(= underneath the sleeve), and measure the work from here onwards. Top part: Now the front part is put tog. Crochet around from here onwards . Crochet over the back piece (from right front arm hole towards the left front armhole) = 104-112-128-140-152 tr in total on round. Continue to crochet around until the piece measures 8-9-10-11-12 cm from the marker. On the next round dec. 10 tr evenly distributed – read decreasing tips = 94-102-118-130-142 tr. Continue round with 1 tr in each tr until the work measures 11-12-13-14-15 cm from marker. On the next round dec. 6-6-14-10-10 tr evenly distributed = 88-96-104-120-132 tr. 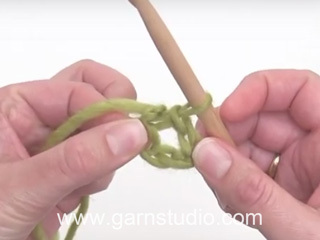 Continue to crochet until the piece measures14-15-16-17-18 cm from the marker – read measurement tips 1. 1st round: 3 ch (= 1tr) *1 ch, skip over 1 tr, 1 tr in the next tr*, repeat from *-* and finish with 1 ch and a sl st in the 3rd ch from beg. of round. 2nd round: 3 ch (= 1 tr) *1 ch, 1 tr in the next tr*, repeat from *-* and finish with 1 ch and a sl st in the 3rd ch from beg. of round. 3rd round: 4 ch (= 1 dtr), *1 ch, 1 dtr in the next tr*, repeat from *-* and finish with a ch and a sl st in the 4th ch from beg. of round. 4th round: 4 ch (= 1 dtr), 1 ch, 1 dtr in the next dtr, 1 ch, 1 dtr in the same dtr, *1 ch, 1 dtr in the next dtr* , repeat from *-* until the marker at the side. Now crochet 1 ch, 1 dtr in the next dtr, 1 ch 1 dtr in the same dtr . Then continue from *-* before finishing with 1 ch and a sl st in the 4th ch from beg. of round. (there are now inc. 2 ch-loops). Crochet the 3rd and the 4th round 2 more times and then the 3rd round 2 times and the 2nd round 2 times = 50-54-58-66-72 ch-loops. The piece measures approx. 36-37-38-39-40 cm from the marking thread underneath the arm. Insert 2 new marking threads, 1 at the beg. of round and 1 after 25-27-29-33-36 ch-loops (= mid sides). Continue to measures from here onwards. 1st round: 3 ch (= 1 tr), *1 tr in the ch loop, 1 tr in the next tr*, repeat from *-* and finish with a tr in the ch-loop and a sl st in the 3rd ch from beg. of round = 100-108-116-132-144 tr. 2nd round: 3 ch (= 1tr) continue to crochet 1 tr in each tr, but crochet 2 tr in 1 tr before and after the marker. ( inc of 4 tr). Finish with a sl st in the 3rd ch from beg. of round. 3rd round: 3 ch (=1 tr), now crochet 1 tr in each tr. Finish with a sl st in the 3rd ch at beg. of round. Now crochet 2nd and 3rd round 3 times = 116-124-132-148-160 tr in total on round. Continue with 1 tr in each tr until the piece measures 17-18-19-20-21 cm from the marker- read measurement tips 1. On the next round inc. 28-20-30-32-38 tr evenly distributed = 144-144-162-180-198 tr in total on round. 1st round: Crochet 1 dtr in each ch-loop with 1 ch between each dtr =72-72-81-90-99 dtr. 3rd. round: Crochet 1 dtr in each dtr from previous row, but crochet 3 ch between each dtr (instead of 2 ch) – Size M and L finish here before the last mussel pattern beg. = 72-81 dtr. 4th round: Crochet 1 dtr in each dtr from previous row with 3 ch between each dtr – Size XL and XXL finish here before the last mussel pattern beg. = 90-99 dtr. After last row of dtr crochet M.1 again (from the start arrow in diagram), but finish pattern after the 7th. row – NB: crochet 1st row of M.1 as follows for pattern to be divisible with number of sts: 3 ch (= 1 tr), 1 ch, *1 tr in the ch-loop, 1 ch, 1 tr in the next dtr, 1 ch*, repeat from *-* until finish = 144-144-162-180-198 ch loops (i.e. 16-16-18-20-22 mussel patterns at the bottom of dress). Crochet 1 dc in the first st, *3 ch, skip approx. 1 cm, 1 dc in the next st*, repeat from *-* and finish with 1 sl st in the first dc at beg. of round. DROPS skirt crochet in a “mussel” pattern made with “Alpaca” and “Cotton Viscose”. 150-150-200-200-200 gr no 1101, white. 200-250-250-300-300 gr no 01, white. Pattern: See diagram M.1. The diagrams are seen from the RS. English Translations for the wording in the diagrams are given at the bottom of this pattern, and they are given in the vertical order in which they appear in the diagram. Measurement tip 1: Because of the weight of the yarn, all measurements should be made whilst the garment is hanging, otherwise it will be to long when it is worn. Measurement tip 2: The garment is very elastic. 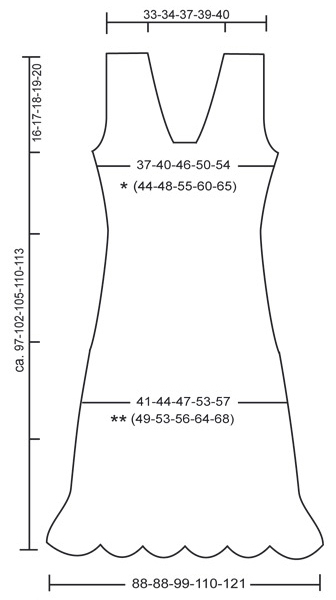 The measurement diagram therefore gives the measures of both the garment and the corresponding body measures. See ** on the measurement diagram. The skirt is crochet from the top and down. 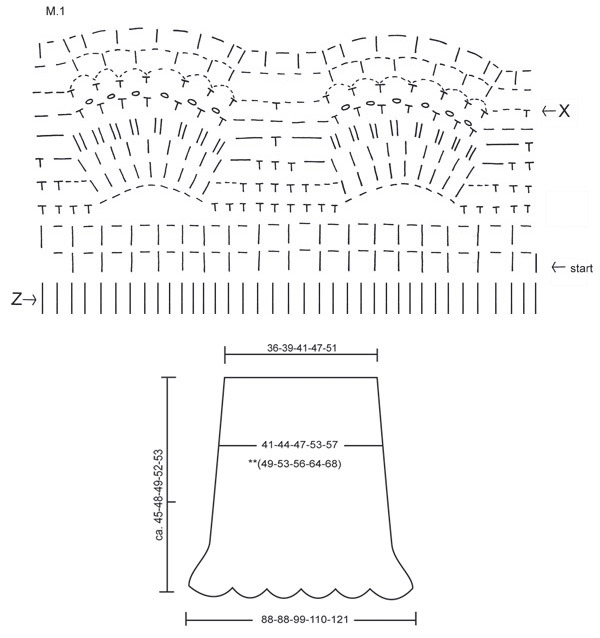 Skirt: Crochet 133-144-154-176-192 ch on with 1 thread of each quality using hook size 4.5 mm. Form a ring by crochet 1 sl st in in first ch. Work next round like this: 3 ch (= 1 tr), * skip 1 ch, 1 tr in each of 3 following ch *, repeat *-*. (Size S ends with 1 tr in last ch and Size L ends with tr in the 2 last ch) = 100-108-116-132-144 tr. Read Crochet info above. Place a marker at beg of round and another marker after 50-54-58-66-72 tr (= markers placed at sides of skirt). Measure work from here. Continue as for crochet dress – from Hip part to Mussel pattern - start to crochet ann 2nd round. When the skirt is finished crochet one round dc in ch-round at beg of work. Band: Crochet with hook 4.5 mm with 1 thread of each quality, ch approx 1 – 1½ meter. Pull chain band up and down 1st round on skirt. Make a tuft each side of band: cut a total of 28 threads (14 threads of each quality) approx 20 cm each. Fold threads double. Fasten end of band around the fold on tuft and wind one of the threads around upper part of tuft to hold tuft together. Fasten thread. ..... 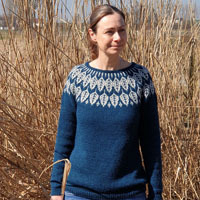 Size M and L finish here before the last mussel pattern beg. = 72-81 dtr. = this round is explained in the pattern, beg. at the start-arrow. Welches Garn empfehlen Sie mir? Ich möchte gerne nur mit einem Faden häkeln. Ich arbeite sehr fest und muss die Nadel immer eine halbe Nummer stärker wählen. Liebe Andrea, Sie können ein Garn der Garngruppe C aussuchen. Die Nadel müssen Sie so anpassen, bis die Maschenprobe stimmt. Bonjour Mme David, on termine chaque tour par 1 mc dans la 1ère/la 3ème ml du début du tour, et on remplace la 1ère B par 3 ml au début du tour. Au 3ème tour de M.1, crochetez 1 ml puis 1 ms dans la 1ère ml du rang 2. Bon crochet! Bonjour Madame Barre, rappelez-vous que pour toute aide ou assistance à la réalisation d'un modèle, vous pouvez contacter votre magasin DROPS ou vous adresser au forum DROPS pour y poser vos questions et recevoir une aide plus détaillée. Ik haak het jurkje in M. Dan zou ik volgens jullie 13 losse bij de rechterschouder van het voorpand moeten haken en dat is inc de 3 keerlossen. Er moet af en toe 1 over geslagen worden. En je moet eindigen met 11 stokjes. Maar, als je de 13 begin lossen doet, 3 eraf is al 10 en dan nog 2 x 1 stk overslaan, dan kom je maar op 8 stk als de toer af is en niet de 11 die het moeten zijn. Hoi Wilma. Je hebt gelijk. Het is een vertaalfoutje in het patroon. Je moet de rechterschouder ook beginnen met 16-16-18-19-19. Ik zal het snel aanpassen. En excuses voor de lange wachttijd. Bonjour Mme Barre, on crochète d'abord chaque épaule séparément, puis on monte 22-28 ml pour l'encolure entre les épaules. À 10-14 cm (cf taille), on augmente de chaque côté en crochetant 1-4 ml (en plus des 3 ml pour tourner) à la fin des 2 rangs suivants (de chaque côté) et on crochète au rang suivant 1B dans chacune de ces ml supplémentaires. On coupe le fil puis on crochète 1-4 ml, on crochète les m du dos et on termine par 1-4 ml, au rang suivant, on crochète de nouveau 1 B dans chacune de ces ml supplémentaires. Bon crochet! Bonjour Mme Barre, pour les augmentations du dos, pour les emmanchures, montez le nbe de ml indiqué à la fin du rang, puis au début du rang suivant, crochetez 3 ml pour tourner (= 1ère B) et 1 B dans la/les ml crochetées pour les augmentations. Bon crochet! Hoi Jeanette. Na het haken van M.1 één keer in de hoogte haak je de 3 tr dstk zoals beschreven. Het stond inderdaad een beetje krom in het patroon, dus ik heb dat aangepast. Bonjour Mme Hluchaniuc, nous avons réussi les tests d'impression sur Mac, en cliquant sur "Imprimer:explications", une nouvelle fenêtre va s'ouvrir - vérifier que votre navigateur autorise les pop'up puis dans la nouvelle fenêtre, cliquez sur "Imprimer les explications". Bon crochet! To clarify the previous question; when the pattern says to increase by 2 ch, which will give 2 dc, do I only chain one and have just a ch3 and a dc? Otherwise, if I increase by 2 ch then I am actually adding on 3 more dc. This is where my stitch numbers are higher than the pattern accounts for. Which is correct? Dear Ashten, when it says (back piece) to inc crocheting 2 ch 1 time it means to inc 2 dc for next row, ie : (size XL) you end row with 2 ch for inc + 3 ch to turn with = you'll get 2 more sts on this side. Repeat same inc a the end of the row to have 2 more sts each side. Happy crocheting! I watched the video tip for increasing with chains at end of row. However, when I increase stitches on the top part, my ending dc count is a few higher than the pattern says. Does the pattern account for the ch-3 at beginning of row during increases? Dear Mrs Ashten, the ch-3 at the beg of row replaces 1st dc and count as a stitch. Happy crocheting!